I am the owner and creator of Crusoe the Celebrity Dachshund, an internet-famous wiener dog, but my introduction to ramps occurred when Crusoe underwent spinal surgery in 2016 for a blown disc. He unfortunately suffers from Intervertebral Disc Disease (IVDD), which affects 25% of dachshunds as well as other long-bodied dogs. That was a really difficult time that I never want to go through again. 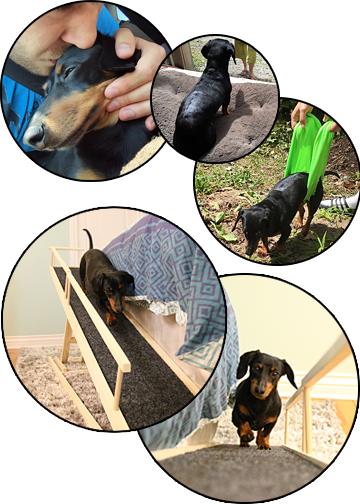 Most IVDD-related injuries occur from dogs jumping off high places, so, a lot of time was spent searching online for a bed ramp, but nothing came close to what we wanted in looks or functionality. So over the past couple years, prototypes were built and rebuilt, and finally I created a ramp that WORKS, allowing our little pup to get onto and off the bed easily and safely. But it was the added features of being adjustable to different heights, reversible railings, easily collapisible/stowable that make it versatile and useful for everyone with a small dog. Introducing, DoggoRamps! It is great to have a product that solves a problem but can also make a difference in protecting dogs from injury, especially dachshunds with their sensitive backs. Seeing my little guy through surgery, teaching him to walk again, and seeing him suffer while not even understanding himself why it was all happening, was... heartbreaking. No dog owner or dog should have to go through that. I hope, am confident, my invention will help save pups avoid accidents, and allow pups and hoomans to enjoy more cuddles in bed, without the worry.